In a surprise development, less than two weeks before President Donald Trump’s decision on the fate of the Iran nuclear deal, Israeli Prime Minister Benjamin Netanyahu made serious charges about Tehran's nuclear program. He said Israel obtained 100,000 “secret files that prove” Iran lied about never having a nuclear weapons program. Furthermore, he alleged that Iran worked to “expand its nuclear weapons know-how for future use,” even after 2015 nuclear accord. Netanyahu presented maps, charts, photographs, and videos allegedly detailing Project Amad, whose goal was to design, produce and test nuclear weapons. He said that the information had been shared with the United States and that it could vouch for its authenticity. “After signing the nuclear deal in 2015, Iran intensified its efforts to hide its secret nuclear files,” said Netanyahu. He drew four conclusions from the archives. The prime minister presented a document seeming to indicate that Iranian Defense Minister Ali Shamkhani split the nuclear program into two parts, covert and overt, in 2003. “The general aim is to announce the closure of Project Amad…. Special activities will be carried out under the title of scientific knowhow development,” read the directive. Since 2013, Shamkhani has served as Secretary of the Supreme National Security Council, one of the Iran’s most powerful decision-making bodies. Netanyahu claimed that head of Project Amad, Dr. Mohsen Fakhrizadeh, is continuing his work in 2018 with many of the same personnel. In 2007, the Office of the Director of National Intelligence released a report on Iran’s nuclear intensions and capabilities. “We judge with high confidence that in fall 2003, Tehran halted its nuclear weapons program; we also assess with moderate-to-high confidence that Tehran at a minimum is keeping open the option to develop nuclear weapons,” it said. The Agency’s overall assessment is that a range of activities relevant to the development of a nuclear explosive device were conducted in Iran prior to the end of 2003 as a coordinated effort, and some activities took place after 2003. The Agency also assesses that these activities did not advance beyond feasibility and scientific studies, and the acquisition of certain relevant technical competences and capabilities. The Agency has no credible indications of activities in Iran relevant to the development of a nuclear explosive device after 2009. President Trump has demanded fixes to the Joint Comprehensive Plan of Action (JCPOA) under threat of withdrawing from it; he is due to make a decision on May 12. “I'm sure he'll do the right thing. The right thing for the U.S. The right thing for Israel. And the right thing for the peace of the world,” said Netanyahu. Trump watched part of Netanyahu’s briefing just before his joint press conference with Nigeria’s president on April 30. “I think if anything what’s happening today … and what we’ve learned has really shown that I’ve been 100 percent right [about Iran],” said Trump. This “is not an acceptable situation,” he said, referring to Tehran’s alleged archival of plans for nuclear weapons. E.U. foreign policy chief Federica Mogherini said Netanyahu’s revelations warranted investigation by the IAEA but did not necessarily impact the JCPOA. “What I have seen from the first reports is that Prime Minister Netanyahu has not put into question Iran's compliance with the JCPOA commitments, meaning post-2015 nuclear commitments,” she said in a statement. The following is a transcript of his remarks and a video of a later interview with CNN. "Good evening. Tonight, we’re going to show you something that the world has never seen before. Tonight, we are going to reveal new and conclusive proof of the secret nuclear weapons program that Iran has been hiding for years from the international community in its secret atomic archive. Here’s what Project Amad’s explicit goal was: creating nuclear weapons. 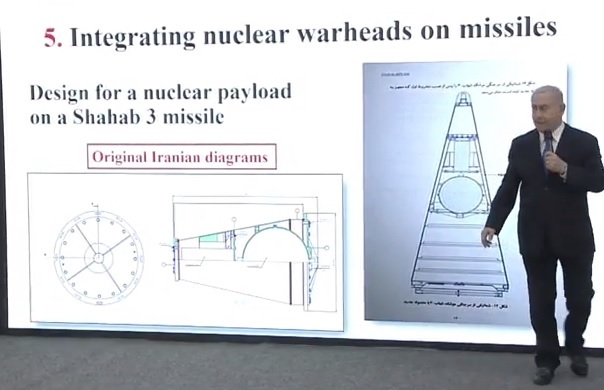 This is an original Iranian presentation from these files, and here’s the mission statement: Design, produce and test five warheads, each with ten kiloton TNT yield for integration on a missile. You don’t need to read Farsi to read 10 kilotons here. TNT. This is the specific goal of Project Amad. That’s like five Hiroshima bombs to be put on ballistic missiles. This is an original Iranian spreadsheet from the archives of Project Amad. Look at what we have here. Yellowcake production, centrifuge enrichment process, warhead project, simulation project, and test. And indeed, when we analyzed what’s in these archives, we found that Project Amad had the all the five elements, the five key elements, of a nuclear weapons program. I want to take them one by one. Second component – developing nuclear cores. Here’s a photo showing the casting process and a cast metal core, from the archives. And here’s a secret underground facility the Iranians were building to produce nuclear cores. We have hundreds of documents for each of these components. Third component – building nuclear implosion systems. This is an original Iranian photo of a measuring device for implosions. And here’s a simulation of a nuclear implosion. Fourth element – preparing nuclear tests. Here’s a map of five potential locations for a nuclear test in eastern Iran, One, two, three, four, five. And fifth – integrating nuclear weapons on missiles. Here’s a design for a nuclear payload on a Shahab3 missile, from the archive. Here’s the warhead, here’s the bomb. And I don’t have to remind you, I think, that Iran is continually expanding the range of its ballistic missiles, its nuclear-capable missiles. They started with 1,000 kilometers, they’re now up to 2,000, roughly. They can reach Riyadh, Tel Aviv, Moscow, but they’re working on far, far greater ranges. They’re planning much longer range missiles to carry nuclear weapons. There’s another document from the archive. This is following the new directive of Iran’s Minister of Defense, Mr. Shamkhani, today he’s the director of the National Security Council. Following the new directive of Iran’s Minister of Defense, the work would be split into two parts, covert and overt. A key part of the plan was to form new organizations to continue the work. This is how Dr. Mohsen Fakhrizadeh, head of Project Amad, put it. Remember that name, Fakhrizadeh. So here’s his directive, right here. And he says: “The general aim is to announce the closure of Project Amad,” but then he adds, “Special activities”—you know what that is—“Special activities will be carried out under the title of scientific know-how developments.” And in fact, this is exactly what Iran proceeded to do. It continued this work in a series of organizations over the years, and today, in 2018, this work is carried out by SPND, that’s an organization inside Iran’s Defense Ministry. And you will not be surprised to hear that SPND is led by the same person that led Project Amad, Dr. Fakhrizadeh, and also, not coincidentally, many of SPND’s key personnel worked under Fakhrizadeh on Project Amad. So this is a terrible deal. It should never have been concluded. And in a few days’ time, President Trump will decide, will make a decision on what to do with the nuclear deal. I’m sure he’ll do the right thing. The right thing for the United States, the right thing for Israel and the right thing for the peace of the world." “I think no one had better intelligence on Iran than Israel. And when we got this trove of 100,000 documents, we learned so many things that we didn’t know. We’re still learning them. We needed to translate it from Farsi. All of these documents, all these simulations, all this data, all this testing, and everything, all these sites, we’ve learned an enormous about Iran’s secret nuclear program. Now, the deal that everybody is talking about was premised on the fact that Iran had no such material. But Iran bothered – took enormous pains – after the nuclear deal – and before – but especially after, to hide this information. It’s like an arsenal of knowledge. It’s not just in the minds of people, who they have, it’s actual calculations that they’ve done. The blueprints. The measurements. They kept it hidden because they don’t want the world to know what I showed yesterday, that they actually have this capability – a pretty advanced capability – to manufacture nuclear weapons. “Well first of all, there is an enormous amount of new information that we dind’t know, that shows how advanced they were in their bomb-making work. So that’s the first thing. Second, if people knew this, then how could they close the file and say they never did anything like this. This was the condition for entering the deal. Third, I think it’s crucial to understand that the nuclear deal right now that we are discussing, is premised on the assumption that Iran will somehow become a peaceful country. It’s not. It’s become an empire that’s devouring one country after another. And that they are doing before they have nuclear weapons. “There are many premises that are incorrect in your statement. The first is, we’re better off because we have this deal. No, you’re not, because this deal, the fact that you have a dangerous deal, the fact that Iran is keeping or not violating a dangerous deal, does not make it less dangerous. It’s completely flawed. It’s based on lies. It’s based on the fact that they have a nuclear weapons program and knowledge they stored up. They didn’t come clean with it. It’s also based on the fact that Iran will somehow be a docile neighbor. That’s not what’s happening. The opposite is happening. I said from the start, if you want peace, if you want security, you should oppose that deal as structured. I said that. I said that Iran is not going to be more pacific, more moderate, once you sign the deal. And that is exactly what has happened. Iran has done the very opposite. It’s taken in the money, the billions, and it’s using it to conquer Yemen, to fire rockets on Saudi Arabia, to colonize Syria militarily, to arm Hezbollah with the most dangerous missiles on earth, to call for Israel’s annihilation, to spread its totalitarian wings throughout the Middle East and to oppress its people inside Iran to boot. So, the whole premise that this deal somehow guarantees a safer, more moderate Iran is wrong. This deal paves Iran’s path to a nuclear arsenal. If you got rid of it, the first thing that would happen is that you would crash Iran’s money machine, in which it’s pursuing its dreams of a conquest and empire. They are funding it with tens of billions of dollars. Their aggression throughout the region. And this deal facilitates it. If you take away the deal, they are going to be in a huge economic problem. “Well nobody is seeking that kind of development [war]. Iran is the one that is changing the rules in the region. Iran is the one that is practicing aggression against every country in the Middle East. Iran is firing rockets into the capitals of neighboring countries. And Iran is preparing 150,000 rockets to be fired in Israel, with the explicit goal of annihilating us. Iran is also moving its army, that’s it declared purpose, right next to the Golan Heights. Right next to Israel. So, Iran is obviously on a campaign of aggression. “Well, you can make all your assumptions. One thing is clear, Israel is not threatening the annihilation of any country. And you know, it’s interesting that the nuclear arms race that I predicted would unfold once this deal was signed, because everybody knew that they were just kicking the can forward for a few years and that Iran would get a nuclear arsenal, so now you hear other countries in the region saying we want nuclear weapons too. Or rather, we want unlimited nuclear enrichment of uranium the way that Iran has it, why shouldn’t we have it? Click here for Iranian reactions to Israel's claims. Click here for European remarks on Prime Minister Netanyahu's revelations about Iran's nuclear program. Click here for the U.S. response to Israeli allegations. Click here for the IAEA's statement and report about Iran's nuclear activities. Click here for responses from experts and former officials.